Located on the corner of Broadway St. and Central Ave NE, 612Brew has a big, open taproom to enjoy their brews in. With several year-round beers on tap (including the taproom only Zero Hour) plus rotating seasonal brews, there is sure to be something for everyone on tap. 612Brew does have a pretty decent sized parking lot on-site for customers to park in free of charge. There is additional parking on Tyler Street NE. At very busy times you may have to park a little ways down the street but normally the lot is ample for visiting drinkers. Yes, they sell growlers at 612Brew. Grab a couple during normal taproom hours (10pm cutoff for growler sales at all breweries in MN). Because this is Minnesota, they must be 612Brew labeled growlers and they cannot fill anyone else’s growlers. 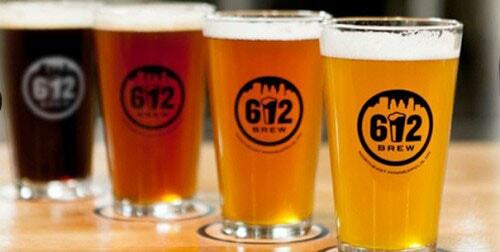 For more information on 612Brew, checkout their website. I’m thirsty already.